Along the Atlantic Coast south of Cape Cod, the cold months are the best time to see Hooded Mergansers. They winter along our unfrozen coast, favoring brackish water, and spend the summers inland to the north and west, on wooded lakes, ponds and rivers. They are famous for the big, white and black head crest that males display when trying to attract females. In his Essential Field Guide Companion, Pete Dunne says it “opens and closes like a Chinese fan.” The female also has a collapsible crest, which is reddish and not nearly as showy. These birds are excellent at diving and can chase and catch fish with ease. They also eat just about anything else in the water, from crabs and insects to plants. 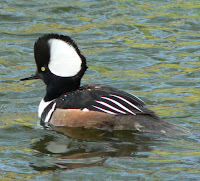 Hooded Mergansers used to be sort of rare, but their numbers have been improving. One reason for their resurgence is the large number of nesting boxes that have been set up, mostly to attract Wood Ducks. Hooded Mergansers, also cavity nesters, have been appropriating the Wood Duck boxes. Of course, they will also use sizable holes in trees, and the reforestation of our once agricultural region may also be contributing to the population increases in the Northeast. Not surprisingly, the nesting trees must be near water. In the spring, a few days after their eight or so offspring hatch, the babies must begin finding their own food. But first they have to get to water. If the nest hole is high in a tree, the parents will probably carry them one at a time down to the ground and nearby water. If the nest is low enough, the ducklings may be encouraged to jump – or tumble – down. The babies can swim, dive and feed themselves long before they are large enough to fly. We have hooded mergansers on our one acre freshwater pond every fall & winter when there is open water. They show up unpredictably in pairs, never more than two or three, dive for what must be small fish and insect larvae, and never stay for more than a few hours or a day. They are not common visitors and stay away from the more usual visiting mallards. These hooded mergansers started using our pond in the cold season only in the past few years.